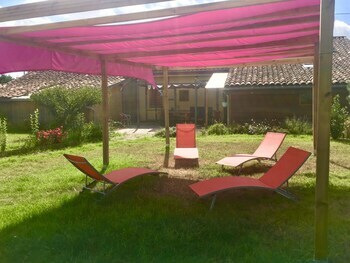 When you stay at Ecologîte Les Sureaux in Meauzac, you'll be 13 minutes by car from Pont Napoléon. Featured amenities include complimentary wired Internet access and multilingual staff. Free self parking is available onsite. A stay at D Day Aviators places you in the heart of Arromanches-les-Bains, steps from Gold Beach and Seine Bay. With a stay at this apartment in Cannes (Cannes Old Town), you'll be within a 10-minute drive of Palace of Festivals and Congress Hall and La Croisette. When you stay at Hostellerie d'Aussois in Semur-en-Auxois, you'll be within a 5-minute drive of Semur-en-Auxois Church of Notre Dame. Free self parking is available onsite. With a stay at Chateau de Briancon in Baune, you'll be 13.1 mi (21.1 km) from Musee Jean Lurat et de la Tapisserie Contemporaine and 13.6 mi (21.9 km) from Chateau d'Angers.